Bellamy is a small boy, about 2 years old. He is being fostered in Richmond, VA. Bellamy loves to snuggle and is very affectionate. He gives kisses and just wants to be close to his person. Bellamy lost an eye at about 6 months of age, but he has no problems seeing out of his good eye. He is easy going and loves car rides! He gets along well with people and is playful with other small dogs. Bellamy is curious about new places and loves sniffing and playing outside in the yard. He walks well on leash. Don’t let his small size fool you though, he is FAST! He will run out a door if left unattended as well as dig under a fence. Sweet Bellamy is an escape artist! He has been adopted out and returned because he got away from his owner on multiple occasions. He needs an experienced owner who is willing to put the time into training Bellamy not to bolt. A fenced-in yard is a must for Bellamy to be able to run and play safely. If you are interested in adopting Bellamy, please be willing to take a look at your property and fix any known issues that may provide Bellamy with an easy escape route. For example, is your fence easy to dig under? If so, you can line the edges with paving stones or bury chicken wire that he can’t dig through. Bellamy is a perfect little love bug and would be a joy for any owner who is willing to help him learn boundaries. If you are interested in more information or in adopting Bellamy, please fill out an application to adopt at https://www.potomacpekes.org/onlineapplicationadopt.htm. We accept applications from Virginia, Maryland, District of Columbia, and areas close by. We require a vet check and a home visit. Previous experience with Pekes is always a plus! Bellamy's adoption fee is $350.00. Rocky, who is being fostered near Richmond, VA, is 10 years old and is a precious love-bug. This sweet boy loves going camping with his foster family and his furry playmates. He has a soulful face which will grab at your heart. Rocky is a laid back boy! He enjoys a good belly rub! Rocky also loves to roll around and play with his toys. He loves making them squeak. Most of all, he just wants to be loved and in your lap or close by. Rocky would love to have a playmate to run with and a fenced-in yard. He needs both of these. He is also used to having someone at home during the day. If you are interested in more information or in adopting Rocky, please fill out an application to adopt at https://www.potomacpekes.org/onlineapplicationadopt.htm. We accept applications from Virginia, Maryland, District of Columbia, and areas close by. We require a vet check and a home visit. Previous experience with Pekes is always a plus! Rocky's adoption fee is $200.00. Ammo, who is being fostered in Richmond, Va., is 10 years old. He is a beautiful little boy. He is good-natured, but would do best in a home with no small children. Ammo just wants to be loved! He has settled in nicely in his foster home. Ammo is quiet, but curious and loves to explore and wander around his new home. If you leave for a bit, he will welcome you home with much enthusiasm! He is such a sweet boy who has decided that he really likes his foster dad! Ammo is house trained and will let you know if he needs to go out. He will paw you, go to the door, or let you know with a very soft bark. He walks well on a leash and boy does he love to walk! Ammo would also love to have a fenced-in yard to run and play outdoors. If you are interested in more information or in adopting Ammo, please fill out an application to adopt at https://www.potomacpekes.org/onlineapplicationadopt.htm. We accept applications from Virginia, Maryland, District of Columbia, and areas close by. We require a vet check and a home visit. Previous experience with Pekes is always a plus! Ammo's adoption fee is $200.00. Bugsy is a sweet senior approximately 13 years old and is being fostered near Virginia Beach, VA. He is doing great in his foster home and is a healthy senior. Bugsy’s hearing is fine, but he does need eye drops to help his limited vision. He loves meal time, watching television with his humans and snuggling on his blankets! Bugsy knows he is a good boy and tries to roll on his back for belly rubs. He loves to be brushed and scratched and enjoys roaming around outside when it’s warm. It would be wonderful if Bugsy could have a fenced-in yard to roam and play in. He would love to be in a quiet home with adults, where he can relax and feel safe. In return, Bugsy will shower his humans with all the love and affection he has to offer. If you are interested in more information or in adopting Bugsy, please fill out an application to adopt. https://www.potomacpekes.org/onlineapplicationadopt.htm. We accept applications from Virginia, Maryland, District of Columbia, and areas close by. We require a vet check and a home visit. Previous experience with Pekes is always a plus! Bugsy’s adoption fee is $100.00. 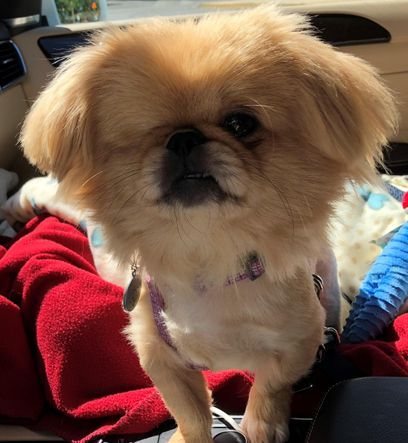 Thank you for your interest in adopting a rescued Pekingese. Pekingese enter our rescue system from a variety of sources: shelters, private give-ups, etc. The average age of the dogs we see in rescue is two to five years old, with puppies under a year old being very rare. (A note about age: Pekes given appropriate care can live well into their teens.) Males are much more common than females. All dogs are spayed/neutered prior to placement, are current on routine inoculations, and tested for heart worm. A medical history accompanies every placement. All our dogs are pure-bred Pekingese. 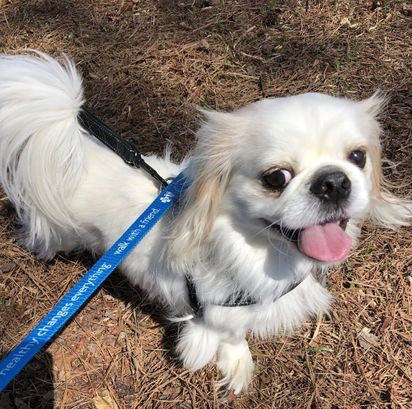 However, they may exhibit some characteristics different from those Pekingese you may have seen in the show ring, such as shorter coats, more length of nose and legs, etc. 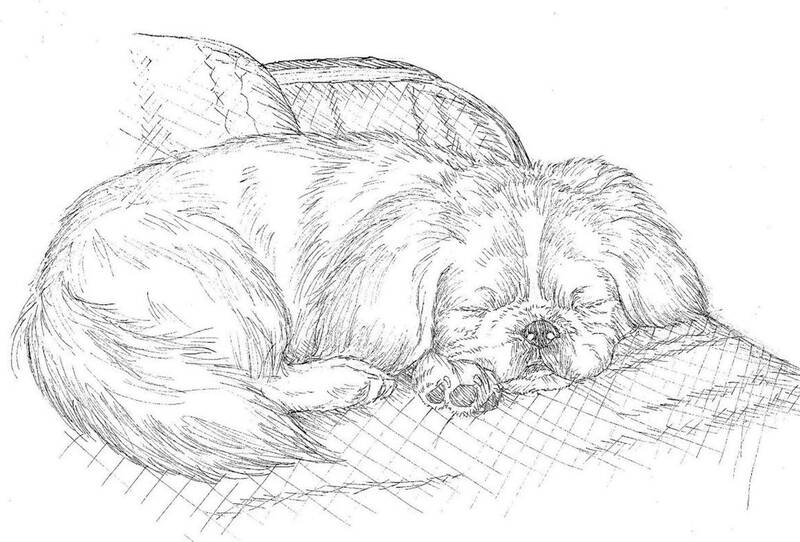 Regardless of the physical appearance, the wonderful Pekingese character is always true. 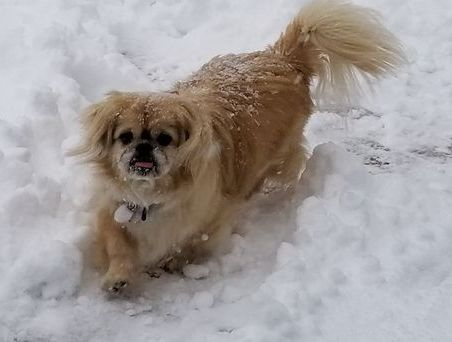 Our rescued Pekingese can be adopted out in Virginia, Maryland, District of Columbia, and surrounding areas. *Please Note: Given the temperament of Pekingese towards very young children, we typically DO NOT adopt to families with children under the age of 8. Our requirements for adoption are simple, but, are not negotiable. We require a veterinary reference, a fenced-in yard or other form of protected exercise area. Potential adopters must be willing to submit to a home visit prior to the adoption, must complete an adoption application, an adoption contract, and pay an adoption fee at the time the dog is turned over to their care. As Pekingese fall into the category of brachycephalic dogs (flat faces) and are, therefore, heat sensitive, air-conditioned environments are strongly recommended for the summer months. Although Pekingese can be a great family pet, they are not recommended for homes with small children. The adoption process can take several days and sometimes several weeks, so your patience is greatly appreciated. If during that time, you have questions, feel free to contact us. Who Is In Charge of the Decision Process? All applications are reviewed by the PVPC Rescue Committee and placements are made at the discretion of the Committee and of the particular dog's foster care giver. 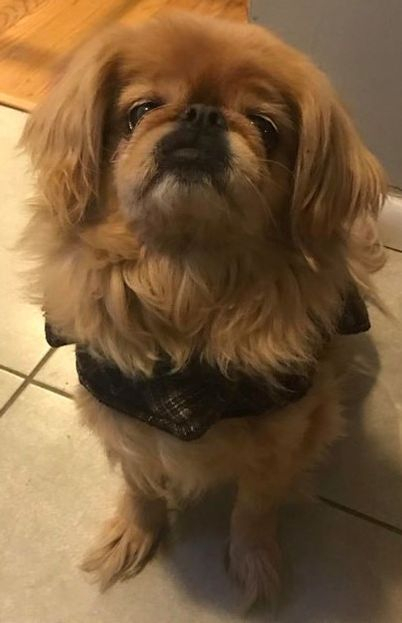 Once your application is sent to us, we will share information with you on Pekingese available for adoption at the time. 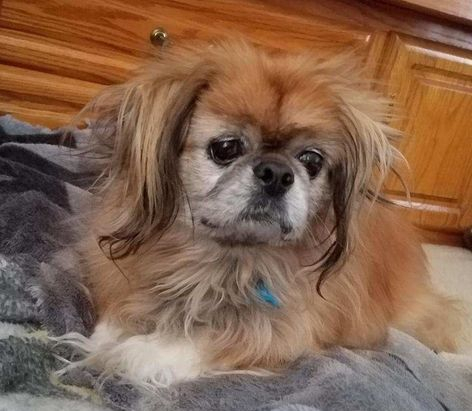 Using our expertise gained from placing hundreds of Pekingese over the years, we make our best judgment in matching the needs of individual dogs with those of our adopters; therefore at times, we will offer an applicant a different dog than the one he/she has applied for. All applicants must submit to a home visit and a veterinary reference check. As the welfare of the dogs in our care is our number one priority, PVPC reserves the right to deny any application. Are the Rescued Dogs in Good Health? All of our dogs available for adoption have received veterinary care and have been spayed or neutered, are current on their vaccinations, and are micro chipped. We treat our rescued Pekingese for all the medical needs of which we are aware. If there are any chronic or ongoing health issues, they will be explained to potential adopters prior to the adoption. What About "Not So Young" Pekingese? Senior Dogs Need Love Too! What Are the Fees for Adopting a Dog? As of April 12, 2009, our adoption fee structure is as follows: for dogs up to 2 years of age the fee is $350; for dogs 3 to 7 years of age the fee is $300, and for dogs over 8 years of age and for special needs cases, the fee is $250. Our organization is entirely funded by contributions from the public and by the adoption fee we receive for the dogs we adopt out. These funds help us defray all of the costs we incur while the dogs are in our care. Download and complete an Application to Adopt a Pekingese, or complete an Online Application Click Here !